Happy Holidays! published on December 14, 2015 Rachel5 Comments on Happy Holidays! This comic is actually a follow-up to the comic of last week! You can click the arrow above, or click here to read it. Our own christmas tree is not made of board game boxes, but is an actual tree with decorations. 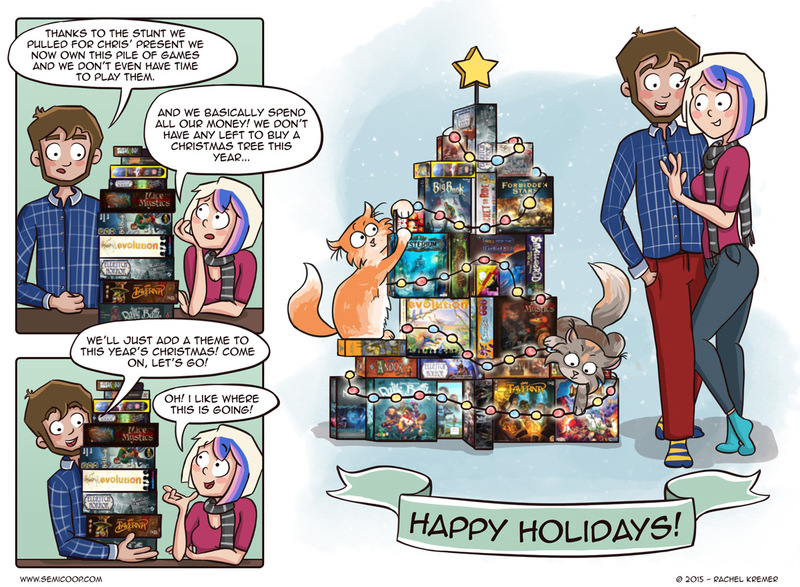 😉 Although fun, the board game christmas tree seemed a little impractical in real life. So, 2015 has almost come to an end and the holidays are upon us! 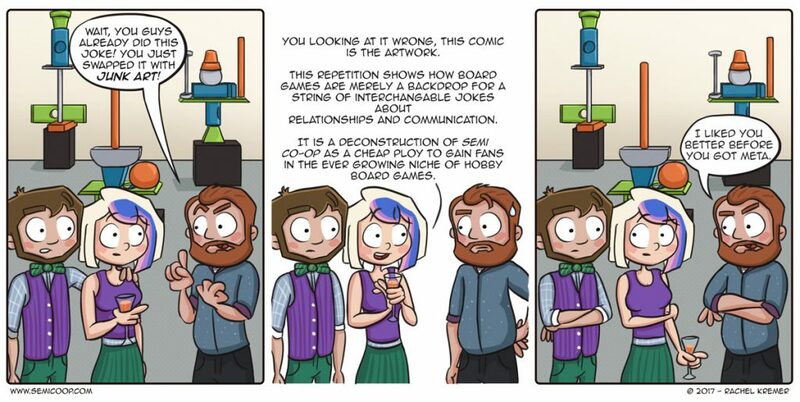 A perfect time to play a lot of board games, but also a period with somehow less free time than expected, mostly due to the many social engagements. We don’t have any great plans this year though. We’ll spend some time with our families and we have a list of games that we’d really like to play. We still need to try the United Kingdom expansion for Ticket To Ride, play more Evolution and Roll for the Galaxy. And maybe some more Alchemists or Lords of Waterdeep. We played Lords of Waterdeep for the first time this weekend, and we were very surprised how much fun it was! We were afraid it was ‘just another’ worker placement game, but it turned out that we were wrong. We had tons of fun playing it with six players. Another fun thing about this period are the top lists that are popping up, like Shut Up & Sit Down’s Top 50. We were suprised how little games we own or we’ve played that are on their list. Again: there are too many amazing board games! The expansion for Lords of Waterdeep makes it even better. Couldn’t recommend it enough. Ah yes, I forgot to mention that we actually played it with the expansion, else we couldn’t play it with 6 players. 🙂 It seemed like the corruption tokens are certainly a good (maybe even neccesary?) addition to the game, it adds a little risk-taking to the game, which makes it more interesting. The most beautiful Christmastree ever! I love that one of the kitties is going after Sushi Go. Perfect touch! Loving your comics. Came here after seeing them on CoolStuffInc.